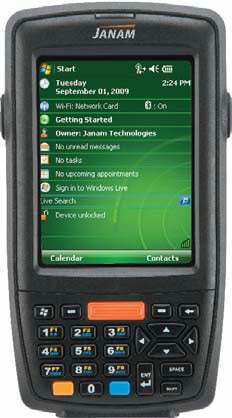 Janam XM66 - Wireless Mobile Computer (Windows Mobile 6.1, WLAN 802.11a/b/g, Bluetooth, Numeric, 128/128MB). Must order cradle kit or cables and power supply separately. See accessories. Ease of use, durability and flexibility are critical to mobile workers. The Janam XM66 delivers it all with Windows Mobile 6.1, advanced barcode scanning, robust WLAN communication and long battery life. It features the latest, most powerful Freescale processor and double data rate (DDR) memory, making it faster than other devices in its class. And Janam's XM Series devices are the only products in the rugged mobile computing category that weigh less than 10 ounces and have a full 3.5" display. The Janam XM66W-1NAFBR00 is also known as Janam Technologies LLC	JAN-XM66W1NAFBR00	or XM66W1NAFBR00	.